OpenText™ Analytics Suite helps organizations improve decision-making, gain operational efficiency and increase visibility by enabling IT to place interactive dashboards, reports, and data visualizations quickly into the hands of business users. Leveraging all your data—whether structured or unstructured, internal, CRM, big data, Internet of Things, or social media—in relevant, interactive visualizations, increases your opportunities for growth. Analytics Suite features common, shared services such as single sign-on, single security model, common access, and shared data. Analysis results from OpenText Big Data Analytics can be easily shared and socialized with iHub, while iHub can now access the Big Data Analytics engine via ODA. New Analytics Studio wizards in OpenText iHub help with quickly assembling and formatting your information, starting from a blank canvas. 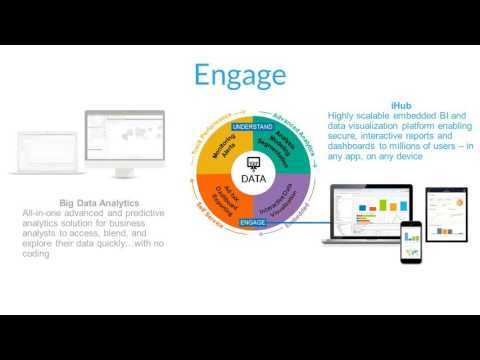 Big Data Analytics adds enhanced self-service data provisioning. Get faster cloud deployment and high availability with three new iHub appliances for PostgreSQL, iHub 16, and iHub 16 System Console. Q. Does it include a design tool? Q. The font in the login screen does not look clear. Is there something I can do to fix this? To improve the display of iHub web pages, enable ClearType. Enabling ClearType makes the words on the screen look much clearer. The following steps show how to enable ClearType on a Windows 7 operating system. 1 In Control Panel, choose Appearance and Personalization. 2 Choose Display. 3 Choose Adjust ClearType text. 4 In ClearType Text Tuner, check Turn on ClearType. Choose Next. 5 In each of the next four screens, click the text sample that looks best to you. Choose Finish. If you turn off ClearType, fonts become aliased again. Q. After completing the installation, the iHub icon did not appear on my desktop. How can I add it there? This problem occurs if you install the software without choosing “Run as administrator”. To fix this issue, please go to the installation folder (default: C:\Actuate3) and drag the file “favicon” to the desktop.